The iPad, iPhone, and iPod Touch all use a menu system called "Springboard" that doesn't exist on the new Apple TV. But what the Apple TV uses instead might be coming to iPad. Instead, the whole interface is an application called "Lowtide", essentially an updated version of the "Front Row" system that has been on Macs and older Apple TVs for years. Lowtide will handle all the user interaction, as well as the video playback and streaming, connecting to Macs or other iOS devices through AirPlay—it's an one-stop shop for the entire Apple TV experience. Thanks to poking around by TUAW, it's looking likely that Apple may include Lowtide in the upcoming iOS 4.2 release for iPad. 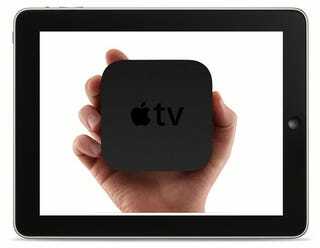 That would mean your iPad would gain all the features of the Apple TV: television rental, streaming from other computers on the local network running iTunes, perhaps even being used as an AirPlay destination for other iOS devices. Think of Lowtide as the app that would turn your iPad into an Apple TV with the screen already attached. It looks like Lowtide will just be on iPads for now, but since all iOS devices share similar internal equipment, there's little to stand in the way of a version of Lowtide for iPhone and iPod touch except a rethinking of the interface to make it more suitable for a handheld device. It's possible, however, that Apple will decide that television rental and the like won't be accessible to the smaller iOS devices. It doesn't really make sense to falsely limit it—why shouldn't I be able to rent a TV show on my iPhone if I want?—but Apple has been known to provide differing levels of access to iTunes content in the past. ...that might be invisible until you buy a TV show on iTunes. But the iPad's "Video" app has been mysteriously threadbare since the iPad's launch. While there's nothing to indicate that Apple will replace the Video app with Lowtide in iOS 4.2, it only makes sense to integrate both the local video playback and the Apple TV experience Lowtide provides into a single movies and television destination—especially one that's so plugged into iTunes.